The 2011 Professional Engagement research offers a fresh perspective on what motivates environmental practitioners. In contrast to previous research, this study is the first at ECO Canada to compare the engagement of workers in the environmental sector to those in the overall Canadian workforce. 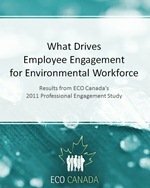 On the whole, environmental employees have higher rates of engagement than the average Canadian worker. However, this engagement varies substantially according to such surprising factors as age, company size, and career path.